Not to be confused with Go-go Pogo. 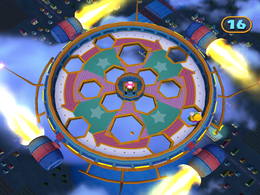 Pogo-a-Go-Go is a 1-vs-3 minigame that is found during the events of Mario Party 7. It reappears in Mario Party: The Top 100. Its name uses the term "A-Go-Go" (from the French À gogo, meaning "galore") commonly used in pop culture, and which is often traced back to Whisky a Go Go, a Hollywood nightclub that took its name from the Go-go dancing it featured. The camera zooms down onto the platform while the three players are dropped on it by helicopters. The holes then open and the minigame begins. 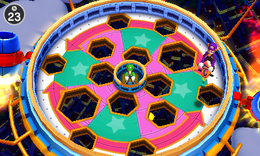 The solo player's objective is to turn the platform clockwise or counterclockwise for 30 seconds to make the other three players fall into the holes. The three players' objective is to simply avoid going into the different-sized holes. If the solo player wins, the solo player, still inside the control panel, performs their victory pose while the other three are carried off by the helicopters. 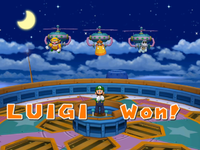 If the team of three wins, the team stands on the platform and performs their victory poses while the solo player, behind them (again, still inside the control panel), performs their losing pose. The winning side performs their victory pose on the results screen, while the losing side performs their losing pose. Rules – "One player spins the stage in an attempt to make the 3 players on pogo sticks fall through a hole." Advice – "The stage turns clockwise and counterclockwise. Look out!" Description – "It's a battle between the player spinning the stage and the 3 trying their best not to fall through!" On-screen (Solo) – "Get your rivals to fall through"
On-screen (Team) – "Don't fall into the holes!" This page was last edited on August 4, 2018, at 09:45.